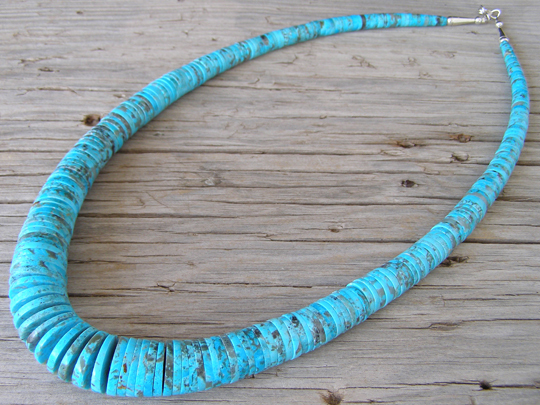 Lupe Lovato is a Santo Domingo Pueblo jeweler who is best-known for his gorgeous necklaces of handmade beads. We have been offering his pieces at Chacodog.com since 2002. His beads are well-known for their smooth transition in size. His sister, Irene Lovato, also makes fine, handmade necklaces. These are beautiful hand-turned, graduated disk beads of stabilized blue Kingman turquoise strung on beadalon (nylon-sleeved braided stainless steel wire). In the center of the necklace, spacer beads of fine-diameter heishi function to keep the beads from binding and allow them to "round out" properly in the front of the necklace. This is a perfectly graduated, smooth strand of masterfully made beads of gorgeous blue Kingman turquoise richly mottled with matrix.